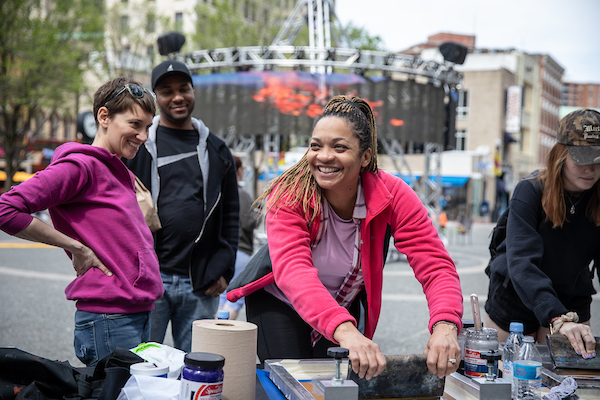 Streaming Space, a collaborative work by artists Alisha B. Wormsley and Ricardo Iamuuri Robinson, transforms Market Square into a space for video, performance, and sound that encourages healing and reflection. 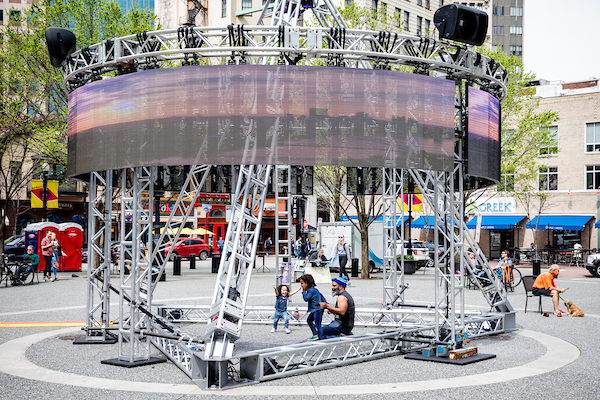 The 24-foot-tall truss pyramid holds mounted LED screens that display meditative video montages of nature and space, and show vintage jazz concerts and films, as well as highlight the work of local futurist artists. An accompanying soundtrack, created by the artists, emits from speakers inside of the pyramid. Coleman’s work as a saxophonist and composer liberated jazz by encouraging musicians to not be limited by any musical conventions, a style known as free jazz. Moreover, Coleman’s use of “harmolodics” was inspired by the geodesic domes of architect R. Buckminster Fuller (1895-1993) and his views on imagination and geometry. Coltrane, on the other hand, was influenced by the deeply spiritual quest she undertook after the death of her husband and collaborator, jazz musician John Coltrane (1926-1967). Her compositions combined music rooted in African American tradition with Eastern influences as her journey led her toward meditation and the teachings of guru Swami Satchidananda. As her music moved towards healing, Coltrane became a Swami herself and opened The Vedantic Center ashram, a spiritual sanctuary for all faiths. Sun Ra claimed to be an angel from Saturn. He ardently upheld the mythos that he created for himself and dressed in clothing that combined Egyptian and futuristic elements. Sun Ra’s music utilized synthesizers and other advanced technology of the time and boasted a radical and extraterrestrial sound. Streaming Space highlights Wormsley’s approach toward interpreting collective memory and the synchronicity of time periods by recognizing that the past, present, and future occur simultaneously. The sound pieces for Streaming Space were produced by Robinson. He investigates the immediate expressions of sound, the traces they leave behind, and the future spaces they have yet to fill. For Robinson, sound allows a listener to travel throughout space and time. The visual program for Streaming Space is a compilation of images and sound pieces that activates memories of humankind’s relationship to the planet, settles the chaos of the present, and allows space for healing and care in the future. In addition to Wormsley and Robinson being inspired by Coleman, Coltrane, and Sun Ra, both artists utilize Afrofuturist principles to confront racism, war, and Western power structures. The artists hope that their practices become a hybrid of beliefs, art, and cultures that seek to create spaces for healing, transcendence, and spiritual liberation. For more information about complementary programming for Streaming Space, please visit the events section of this site. Presented by: The City of Pittsburgh through the Public Art and Civic Design Division, Department of City Planning and the Pittsburgh Downtown Partnership with technical assistance from the Office of Public Art at the Greater Pittsburgh Arts Council. Above photographs by Renee Rosensteel.